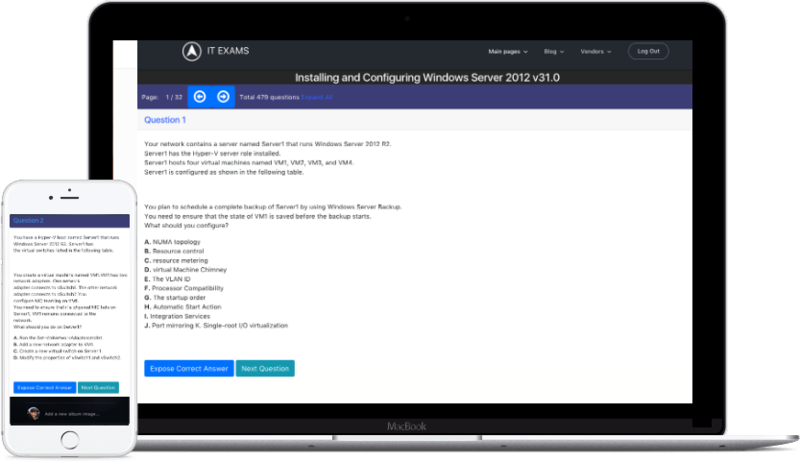 We serve the most contemporary IT certification exam materials of only actual exam questions accompanied by detailed answers - for the very low price of free. today we consist of over 85 IT certification experts who contribute content across all the IT sub-fields. Our question base is being updated on hourly basis to have the latest and most current actual exam questions. We offer free access to our entire actual exam question base, including answers written by top industry experts. ITExams interface simulates an actual test to prepare you for the real life certification exams. In ITExams each question has an open discussion where you can ask for help or contribute your knowledge to others. Free & Unlimited access to all the actual exam questions with detailed answers. You can also enjoy our user-friendly exam-like interface while practicing on actual exam questions. ITExams is the world's first, free, reliable & professionally maintained source for actual exam questions & answers. Our aim is to provide everyone with equal opportunity of a career in the IT industry.